This bike walk/ride commences at Diamond Creek railway station. 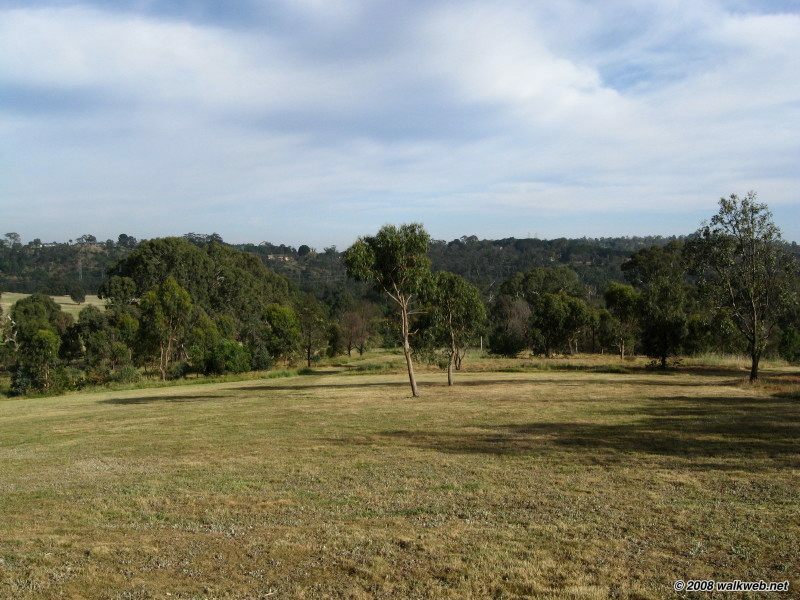 It can be taken as an out and back walk/ride, or alternatively could be finished at Eltham Station, with Diamond Creek a short train ride away. Leaving Diamond Creek railway station cross the car park and walk along Station St to Gipson St and join the Diamond Creek Trail adjoining a small lake in Nillumbik Park. Follow the trail through the park until it reaches Chute St. For safety it is recommend that you cross the busy main road at the pedestrian crossing. Cross over and join the trail once again entering Diamond Creek Reserve at the corner of Diamond St. Follow the trail, which skirts Diamond Creek and eventually reaches open farm and grassed land. On reaching Allendale Road turn left over the narrow bridge and join the Trail on the south side of the road. The Trail now passes through river flats and stands of eucalypts and wattles edging the creek. After passing through Eltham North Reserve you reach Edendale Community Farm/Environment Centre and if time permits a visit is well worthwhile. After leaving Edendale the trail follows a rather unattractive section adjacent to the railway line and Railway Parade. This section requires caution when crossing the main railway line twice before finally arriving at Eltham Station. 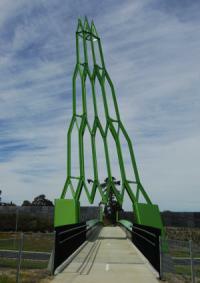 Pass through the Park Gates at Diamond St and follow the trail through Andrew Park and Eltham Central Park. The trail continues under the ‘National Trust’ classified old trestle Railway Bridge before entering the attractive Alistair Knox Park. Continue along the trail passing under the Bridge St underpass alongside the creek through Eltham Town Park and the adjacent Susan St sports reserve. After passing under Brougham Road continue past Eltham Leisure Centre on the right and follow Bell St heading towards Barak Bushland. Alternatively turn left over the pedestrian bridge at the corner of Withers Way and Bell St. This part of the trail runs alongside the Main Road and passes through Wingrove Park eventually joining the Barak Bushland Loop at a pedestrian underpass on the right just after crossing the bridge over the creek. 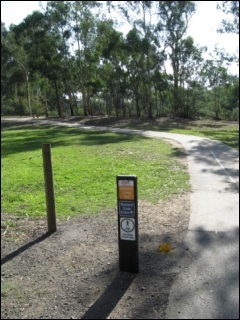 Follow the shared path alongside the main road until you reach the gates into Eltham Lower Park after passing the miniature railway station of Pine Creek. The trail winds its way through the park passing the sports ovals eventually arriving at Homestead Rd. A short but steep descent towards the river Yarra gives access to a new bridge which links to Candlebark Park and the main Yarra Trail. From here make your way back to the entrance to the park and then back towards Eltham station. As an alternative if walking it is highly recommended that instead of following the main trail turn left after entering the park and walk along the roadway past the main station of the miniature railway. 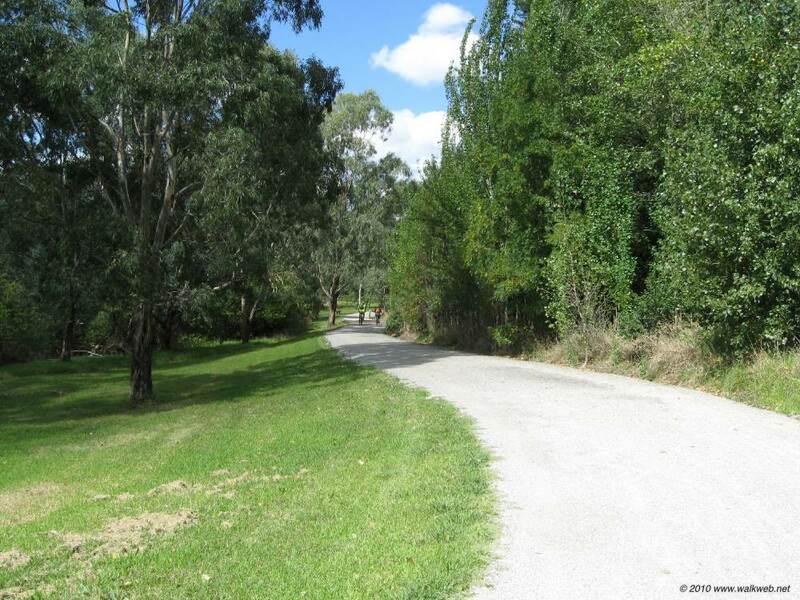 This roadway ends at a parking area and a path follows the creek and past the Eltham Pony club eventually leading to Lenister Farm and a viewing platform over the Yarra River. After taking a break at this very tranquil spot follow the path adjacent to the river until it meets the main cycle trail at the new bridge mentioned earlier. Walk back to the parking area at the entrance to the park to return to Eltham Station along one of the routes described to catch a train. Easy walking or riding along mainly flat concrete, bitumen & gravel surfaced tracks with numerous attractive rest or picnic spots. This circular walk starts at Studley Park boathouse in Melbourne’s inner east suburbs, and provides a pleasant 9km ramble through Yarra Bend and nearby parks, passing two boathouses and a former asylum, with many great views of the city. Start at the parking area at Studley Park Boathouse (Melway 2D, F8) and walk up the hill back to Yarra Boulevard. At this point turn left and follow Yarra Boulevard until a turn-off to a picnic area downhill to the left. 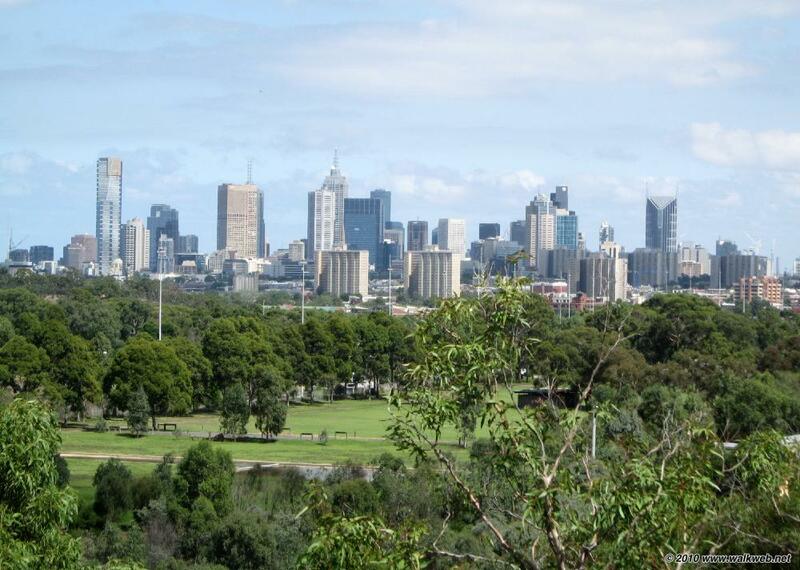 At this point cross over and follow a path uphill to the Wills St Picnic area where there are fine views of the city. From the picnic area continue towards a gate that provides entry into the Willsmere apartments complex. Go through the gate which crosses a small basketball court, and have a quick look at the main, heritage listed, Willsmere building. Converted into private residential apartments in the early 90’s the main building was formerly the Willsmere Hospital and before that the Kew Lunatic Asylum. It features an impressive facade, two large towers and mansard roofs. The front section with a view of the city was for paying customers – there are wings behind which were used for the rest of the patients. A section of one wing, behind the door in the library, was left as-is as part of the re-development agreement. This section houses a small museum and is occasionally opened up to the public along with the grounds (check with the National Trust for any opening dates). Return to the entrance gate, and then turn north-west along a dirt path that runs through a lovely wooded area in front of the Willsmere complex. Follow this path until it emerges on to a grassed area and a sealed path that curves to the right, uphill, towards an old oak and the remains of the former Willsmere dairy. Leave the formed track at this point and pass to the left of the old dairy along a dirt track that turns left downhill and soon reaches Yarra Boulevard. Cross the road, taking particular care to check right for cars or bikes racing down the hill and then turn right along the footpath up the hill. The roads turns to the left and soon heads downhill to a roundabout and a bridge over the Eastern Freeway. Keep following the path over the freeway and up to the crest of the hill. At this point the “Main Yarra Trail” is reached; turn left and follow the spur downhill to the Fairfield pipe bridge. Cross the bridge, noting the Fairfield Boat House to the right, and follow the path up to the right before reaching a turnoff to the left, just before the car park. Turn here as the track double-backs on itself before turning to the right and then crossing Yarra Bend road. Follow the track as it curves left, above the Merri Creek to the right. Keep following the track as it passes a lookout to the right and then eventually drops downhill to pass underneath the Eastern Freeway. The track reaches a pedestrian bridge over Merri Creek. Cross here to have a look at Dights Falls and remains of an old mill and weir. Return across the bridge and follow the path as it follows the bank of the Yarra, initially at river level and then climbing high above to eventually meet Yarra Bend road. Here, turn immediately to the right down a dirt track through an avenue of European trees. Follow this track, again by the banks of the Yarra until it climbs to meet Kanes Bridge. Cross here back to the starting point. Refreshments are available at both the Fairfield and Studley Park Boathouses. Row boats can also be hired at Studley Park Boathouse, which has very pleasant surroundings for a picnic. Yarra Bend Park ramble (kmz file) for use in Google Earth.